Ukrainian Widow Disputes Validity of Pre and Post Nuptial Agreements Due to Language Barrier; Seeks to Receive Her Share of Deceased Husband’s Estate. There’s a growing need for certified legal document translation services for estate and trust litigation involving challenges to the division of one’s estate, particularly when the surviving spouse speaks a foreign language. In In RE: The Matter of the Estate of Kenneth Wolhar v. Wolhar, a surviving spouse filed a petition for an elective share of her husband’s estate after her husband died. The executrix of the estate, who was the decedent’s sister, objected to the petition on the grounds that the spouse had signed pre-nuptial and post-nuptial agreements in which she waived her share of the estate, including her right to claim a spousal allowance. After the filing of the lawsuit, the parties filed a number of motions with a Delaware chancery court. The petitioner filed a motion for a preliminary injunction and a motion for a protective order, among other things, and the respondent filed a motion to compel the production of certain documents along with a motion for attorney’s fees. Ukrainian Petitioner Signs English Prenuptial Agreement and its Ukrainian Translation. The petitioner, who was from the Ukraine, met the decedent in 2007 while the decedent was visiting the Ukraine. The couple married in Kiev, Ukraine in 2010 after the decedent obtained visas for the petitioner and her daughter to come to the United States. Before marrying, the couple signed a prenuptial agreement, which was translated into Ukrainian for the petitioner. The decedent signed the English version of the document, and the petitioner signed both the English and the Ukrainian documents in the presence of a Ukrainian attorney. Summary of Pre and Post Nuptial Agreement and Decedent’s Will. Under the terms of the pre-nuptial agreement, the petitioner agreed to waive all statutory or common law rights she had as the surviving spouse in the decedent’s home or estate. Instead, the agreement stated that the husband’s will would include a provision for the petitioner. After the couple married in 2010, they executed a post-nuptial agreement in 2012 which contained the same provision as the pre-nuptial agreement and in which the petitioner agreed to waive her marital rights. In 2012, the decedent executed his Last Will and Testament in which he bequeathed $5,000 to the petitioner and $1,500 to his daughter and named his sisters as the primary beneficiaries. In 2016, after her husband’s death, the petitioner filed a petition for an elective share of the estate as well as a petition to set aside the pre and post nuptial agreements in family court. 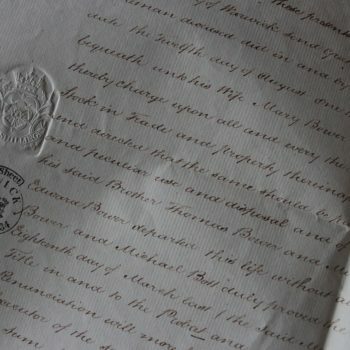 The family court judge dismissed the petitioner’s motions to set aside the pre-and post-nuptial agreements, finding that the court of chancery was the appropriate forum in which to determine the distribution of assets from the estate. The parties subsequently filed numerous motions described above. Basis for Ukrainian Petitioner’s Motion. In response, the decedent’s sister and executrix of the estate argued that the petitioner had received a full financial disclose from the decedent, had participated in the drafting of the agreements, understood English well and communicated in English when she executed the agreements, and had received a translated copy of the agreements prepared by a Ukraine- based translation company. The executrix also argued that the petitioner was adequately represented by an experienced Delaware attorney in addition to the Ukrainian attorney. Court Denies Petitioner’s Motion for Preliminary Injunction. After considering briefing on the matter, the judge recommended that the court deny the petitioner’s motion for a preliminary injunction on the grounds that she had not met her burden of proof in demonstrating the following: a likelihood of success on the merits, an imminent threat of irreparable harm, and that balancing the equities tipped in her favor. The court explained that determinations whether pre or post nuptial agreements are enforceable are highly fact sensitive. The judge held that although there was a reasonable probability that the petitioner would ultimately succeed on the merits once the record was fully developed at trial, that there was not enough evidence to grant the petitioner’s request for preliminary injunctive relief. The court also denied the executrix’s motion for attorney’s fees. The case is In Re: The Matter of the Estate of Kenneth R. Wolhar; Rolhar v. Wolhar, C.A. No. 12860-MG decided on February 6, 2018 in the Court of Chancery of the State of Delaware. **This legal language translation blog article should not be construed as legal advice. You should always consult an attorney regarding your specific legal needs. Contact certified legal document translation service All Language Alliance, Inc. to obtain certified translations from English to Ukrainian, Mandarin Chinese, Spanish, Russian, German, Swedish, and other languages for trust and estate litigation. Real Estate Translation Services Read It!